Gangrene is the death of an organ or body tissue. When the blood supply is cut off, the tissue doesn't get enough oxygen; it begins to die. If the gangrene is widespread, generalized shock may occur. Dry gangrene - The lack of blood supply causes the tissue to dry up and slough off. Wet gangrene - The tissue becomes moist and decomposes. 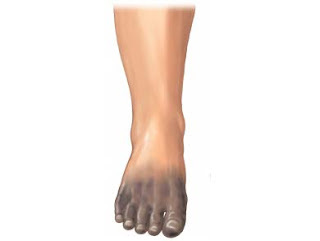 Wet gangrene usually occurs when the tissue is infected with bacteria. Gas gangrene - This is a particular type of bacteria (Clostridia) that produces gas bubbles in the tissue. Antibiotics – These medications are given in a very potent form, through an IV. Blood thinners – These drugs are given to prevent blood clots. Debridement – This is a surgical procedure to cut away dead and dying tissue. It is done to try to avoid the spread of gangrene. Amputation – If an entire toe, finger, hand, foot, leg, or arm is severely affected by gangrene, this body part may need to be removed. Hyperbaric oxygen treatment – This therapy involves exposing the affected tissue to oxygen at high pressure. • Patients with diabetes need to take very good care of their hands and feet. • Surgical patients may be given antibiotics to help prevent infection (especially after intestinal surgery).